Each tour features an experienced, knowledgeable, friendly and supportive staff. We offer excellent client to staff ratio, typically one staff to every 5 to 8 cyclists. All our staff are cyclists and know what you need to achieve your goals. Many of them are alumni from past America by Bicycle tours. They were all handpicked for their expertise, attention to detail, and dedication to serve as support staff. You will find our staff in the van to help with repairs and provide food & water. You will find our staff on bicycles to assist with direction, encouragement, or as ride companions. Whether cycling across town or coast to coast, you will not find a friendlier, more supportive, and experienced group of people than our America by Bicycle support team. After 19 seasons with America by Bicycle, and 62 tours, it is still fun supporting cyclists with a passion for life and adventure. The best part of my job and what makes it so special are: being able to ride, sharing the road and the experiences with everyone, seeing lifelong friendships form, seeing cyclists become stronger, more confident and safer riders. The love of cycling and the people you meet are what it’s all about. I started with ABB in 2005 and have been rewarded with lifetime friendships with riders and my fellow staff. The greatest thrill is to witness someone achieving a goal, whether it be making it to the top of a big climb, surviving a day of challenging weather, or finishing a long distance tour. Helping people to push themselves to new limits and discovering their own hidden strengths is extremely gratifying. I rode across the country with AbB in 2008. Less than halfway, I was talking with the staff. I had to figure out how to do this again (and again). Just over 10 years later, I’m still at it & loving it. Off the bike, I enjoy computers and other things of the nerd persuasion. My passions? Bicycling and technology. I’m addicted to them both. I enjoy leading people down the path to full cycling obsession and using technology along the way. I want to ride my bicycle! Cheesy but true. I've found that riding fixes every situation, even the joyful/sad/nervous/jealous/exciting/angry/boring ones. Between the wonderful sights, smells, and sounds of mother nature and the whir of a mechanical miracle under my tush there's no better situation. Out of the saddle you'll find me tinkering with odd mechanics or building often useless 'art' and sometimes useful 'furniture.' If not, I may be busy exploring another continent. I did my first ride with AbB in 2003, and had such a great time that since then I've ridden almost every tour -- except those “fast” ones! I love experiencing parts of the country that I never knew existed, and doing it with great people I’d never have met any other way. I now have AbB biking buddies all across America and beyond! When I’m not on my bike, I’m usually working on multiple arts and crafts projects in various stages of completion. I have a passion for momentum on and off the bike. This is my 3rd season wrenching for AbB and I can’t wait for the new adventures to come! I am committed to problem-solving calmly and with a bright smile. I enjoy being outside, going on adventures, and seeing new places. In addition to road riding, I love gravel rides and mountain biking. You'll never catch me eating squash, but I’m always down for a good beer. My mother told me that when I was 8 years old I said that I wanted to ride my bicycle across the US. When I retired from the military in '96, that was the first thing I did. It only took that first ride, I was hooked. Since then I've either ridden, staffed, or led over 60 rides across the US and over 70 total rides for AbB. I've thoroughly enjoyed sharing ride experiences and supporting thousands of others who have that same dream. Over that span of years, I've surrounded myself with other staff members who also have the passion to give riders a safe and meaningful experience. Guess I'm still hooked. I rode with ABB for the first time in 2015 and had an absolute blast. I have been working in the cycling industry ever since. Spending time on a bike is better than spending time anywhere else. The cross country tour is a once in a lifetime experience and I have the unique opportunity to guide all of you on that journey. You can find me rocking helmet hair year round underneath my rad pink helmet. 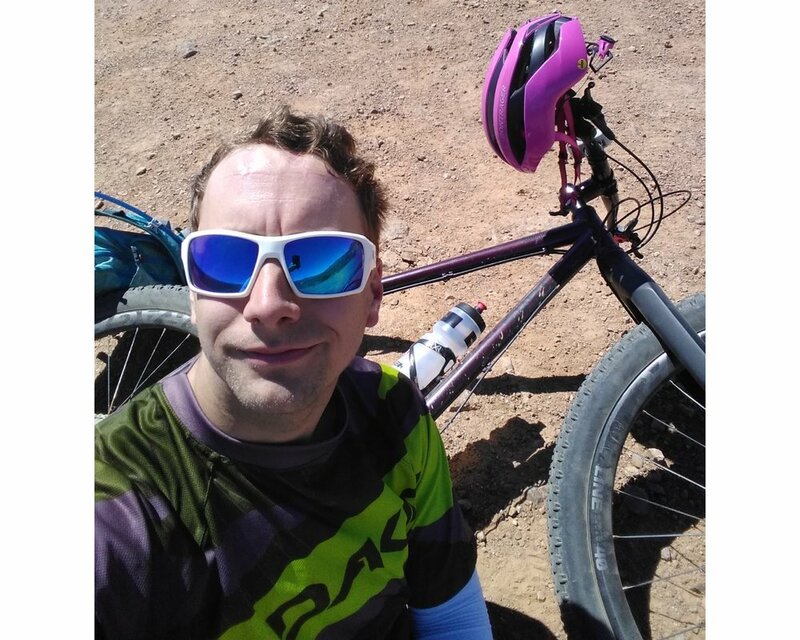 Alex is genetically inclined to enjoy bicycling and supporting those with the passion to ride across the country. In the off season, he spends his time in the Big Apple working in the entertainment industry.